Just over a week ago our daughter MP turned two years old and we celebrated with immediate family at an afternoon birthday party at our home. 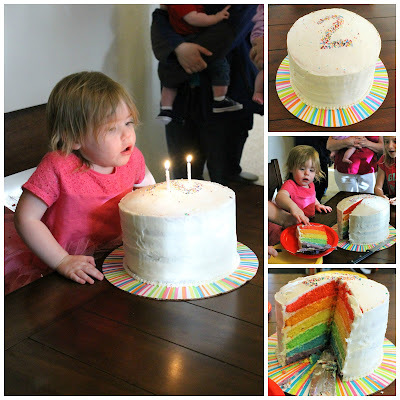 Two years old is the last year I feel like you, as parents, can really guide and ultimately decide on a theme for a birthday party, so we decided to do something fun, bright and colorful just like her - a rainbow themed party. (Last year for her first birthday we had a butterfly themed party). I love entertaining and hosting family and friends at our home, so throwing birthday parties for our kids is a fun treat for me. I remember several birthday parties that I had as a kid and helping my Mom decide on a cake and theme. I love incorporating the kids in the planning of their parties too. After deciding a date and to go with a rainbow theme the first thing we had to do was make an invitation. I had MP (and her big brother LP) help make the invitations. We used cotton balls to paint a rainbow of the front of each card. I pinched clothes pins on each cotton ball to make it easier for the kids to grip. In the inside of the card, we had a simple, colorful poem inviting them to the birthday party. While the invitations might be the first thing we prepare for the birthday party, the biggest and probably most important thing is the food. We served a nice supper for our family of shredded pork sandwiches, my famous baked beans, a rainbow fruit tray, a rainbow veggie tray and chips & dip. It was so nice out, that we set up tables outside and had a picnic. The focal point to any birthday party of course is the birthday cake. Since we went with a rainbow theme I decided to make a double batch of white cake, and split each batch into three layers, so I could make a six layer rainbow cake - red, orange, yellow, green, blue and purple. I used my basic frosting recipe to stack each layer together and to frost the outside. 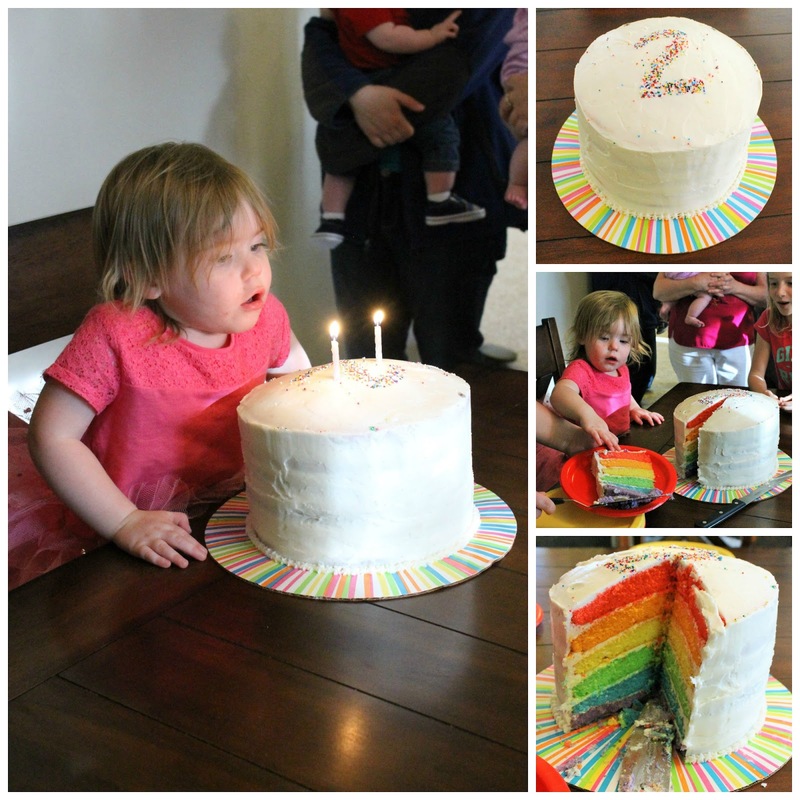 I then had some multi-colored sprinkles from my pantry to put on the cake in the shape of the number two. I just cut out a two from a piece of paper to make a stencil in order to keep the sprinkles in the correct area on the cake. The cake was a hit! We served the cake with our traditional homemade ice cream. she even asked her Dad if she could have a bite of his! The last thing to think about for the birthday party was the decorations. I always keep birthday decorations simple. We put some red, orange, yellow, green, blue and purple streamers on our deck since we had most of the party outside, and we made some photo clouds. The photo clouds were simply free-hand clouds cut out of poster board that had photos from over the last year on them. I then used the streamers to make a colorful loop so they could be hung from doors and windows. I always love looking back at photos over the last year when it comes birthday time and enjoy sharing those photos with our family by displaying them around the house. We also had a bright and colorful flower bouquet for our dinning room table. The party was a great time and I know MP felt very loved. The best part of the party was when we gathered everyone to sing Happy Birthday so MP could blow out her candles, she started the song and was the first to say Happy. It was very cute! I guess she was excited to have some cake. When it is your birthday, what is your choice of sweet treat? Remember to Comment for a Cause! Cute day and happy belated bday to MP! This looks adorable! She's so sweet! Every year I love planning my daughters birthday! You did an awesome job on the cake! I love it! I'm glad to hear that I'm not the only one who actually, truly, loves planning their kids' birthdays! Your daughter is so pretty! This looks like such a fun rainbow birthday party. The healthy party food is best for the kiddos. I am also thinking to throw such a decent healthy party on my son’s birthday. I would be hosting this party at some indoor New York event space.